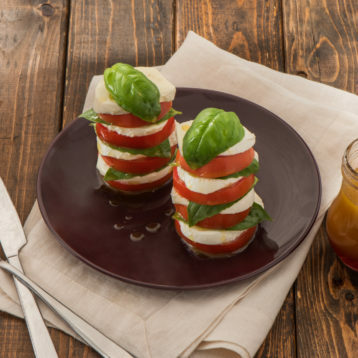 On serving platter, arrange 4 stacks; for each stack, start with tomato slice on bottom, then layer mozzarella slice and basil leaf over top, repeating three more times for each stack (each stack should have 4 slices of tomatoes, 4 slices of mozzarella and 4 basil leaves total). In small bowl, whisk together olive oil, vinegar and salt; drizzle over stacks. Serve immediately.